"The Pony Remark" is the seventh episode of the NBC sitcom Seinfeld. It was the second episode for the show's second season. It aired on January 30, 1991. Jerry makes a tactless remark ("I hate anyone who ever had a pony when they were growing up!") while having dinner with a relative who, it is revealed, had a pony as a child. 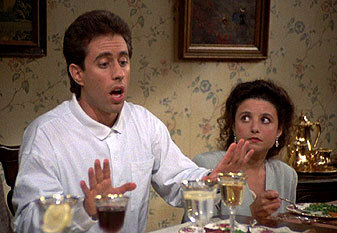 After she suddenly dies the same day, Jerry and the others speculate as to whether his comment may have been a factor. Much to the disgust of Elaine, he has difficulty deciding whether to go to her funeral, or to a championship softball game. Jerry ends up going to the funeral and the game is rained out. Elaine continues her quest for a new apartment in this episode. She asks if she can have the deceased aunt's apartment but it is already promised to Jeffery (Jerry's Cousin). Meanwhile, Kramer and Jerry bet over whether or not Kramer will rebuild his apartment so that it has multiple flat wooden levels instead of needing furniture. Kramer changes his mind and decides not to build levels, arguing that since he didn't attempt it, the bet was invalid.